This post is going to be jammed packed with announcements. So much has been coming together, it’s hard to find time to breathe sometimes! 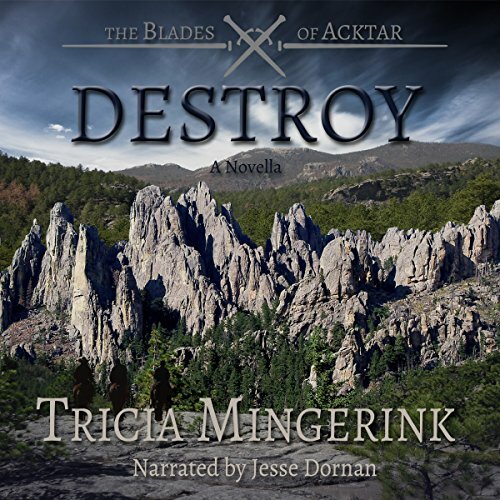 Destroy (The Blades of Acktar 3.5) is now available in audiobook. While I’m excited about the release, that excitement was dampened by the news the narrator Jesse Dornan died unexpectedly shortly after he finished production on this audiobook, and it has released posthumously. I won’t be doing a big giveaway for this one. If you love listening to audiobooks and would be willing to give this one (or the first three books) a listen and leave a review, please send me an email. I have a few free audiobook codes I can give away. For now, Deliver won’t be available on audiobook for the foreseeable future. Dagger’s Sleep is available for preorder for Kindle on Amazon! After the release, I’ll be raising the price from $2.99 to $3.99, so if you want the cheaper price, you’ll want to make sure you preorder. I have also set up a preorder in my website’s store if you would like to preorder a signed paperback from me. I will be shipping the books the last week of May as soon as I receive my copies of the books. You can add Dagger’s Sleep to your want to read list on Goodreads. As many of you know, I’m going to be hosting a joint blog tour with Sarah Addison-Fox to celebrate our two new releases. Her book Dissociate (book 3 in the Allegiance series) releases on May 22 and Dagger’s Sleep releases May 28, so it made sense to combine our efforts, not to mention she has become a dear friend. We wanted to make the blog tour as flexible as possible, so the sign up sheet below has lots of options for promoting one or both of the books. If you don’t have a blog (or otherwise can’t be a part of the blog tour), we also have options to be a reviewer only to post reviews of one or both of the books on Goodreads and Amazon. You can sign up for this in the tour sign up below as well. Since her books are upper young adult Christian fantasy (with an older audience) and mine are mid-level young adult Christian fantasy (with a younger audience), we have listed in the blog tour sign up page a small content advisory so no one is caught off guard. We’ll also have a content advisory picture that blog tour participants can share during the tour as well. As authors, we want to be completely honest about the content of our books so that they can find their way to the right audience of readers who will love them and have their hearts touched by them. If you have any questions about the tour or reviewing the books, please contact me at triciamingerink (at) gmail (dot) com. I’m so excited to start planning this blog tour and share these books with you! I will definitely sign up for this. However, I would like to do an author interview, and this will be the first I’ve ever done. Am I correct in assuming I just send the questions by email prior to the blog tour dates? Also, why are we asked to select two dates for blog posts on the sign-up form? Is that for the two books or for two blog tour posts? Thanks for your help! I can’t wait to read Dagger’s Sleep. We’re asking for two dates, but you’ll only be assigned one of those dates during the actual blog tour. It’s just in case we end up with too many people wanting the same day we can switch people around to the second day they choose. When we send the blog tour information out, you’ll be asked to come up with 5 questions that you’ll email to us. We’ll answer them and email them back to you. Super excited for Dagger’s Sleep! I’m also eager to read Sarah’s book. 🙂 I hope I’m available to post some of those dates with my school schedule! When do signups close? And when would you be sending out Dagger’s Sleep to participants so they can read and prepare book reviews? Sign ups close 3 weeks from today (April 27). You don’t have to post on multiple days if you don’t want to. Picking 2 days gives me flexibility when scheduling the blog tour in case we have too many people signed up for one day. Okay thank you so much! I really hope I can participate! How long is Dagger’s Sleep? Dagger’s Sleep is about the same length as Defy. Do you have any good book recommendations? I Findshed all your books. They where awesome! Jaye L. Knight’s Ilyon Chronicles are very similar to The Blades of Acktar, so I always highly recommend them. Sarah Addison-Fox’s books (Disowned is the first one) are also good, though they do have a smattering of language in them. Jill Williamson’s Blood of Kings series is also really amazing and is what inspired me to write my own Christian fantasy series. Gillian Bronte Adams also writes really amazing Christian fantasy as does Morgan Busse. If you’re looking for gritty, Nadine Brandes has a really good Christian dystopian series. Oops i meant or but I said at. Lol! oops!